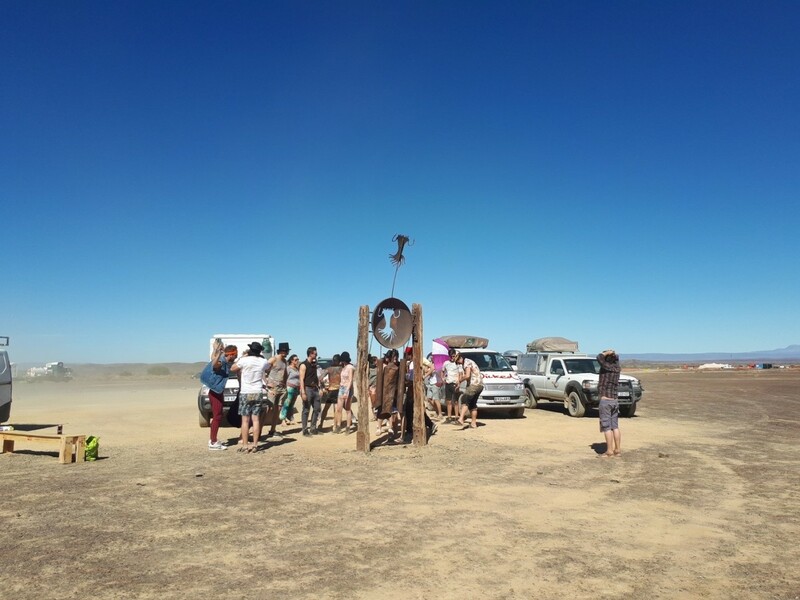 Join the fun-loving, outgoing folks who greet new arrivals, assist virgins bang the Virgin Bell and make everyone feel welcome after their long trip to Tankwa town. Greeters impart the important principles of the event, encourage volunteerism and generally put people at ease just before they enter Tankwa Town. Greeters have carte blanche as to how they welcome new arrivals and many have great ideas on just how set the tone for this wild and wonderful experience. 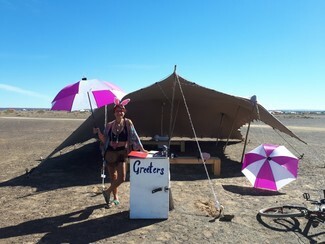 Bring music, dress up, dress down, choreograph a little welcome dance and be the welcoming committee with infectious exuberance that heightens the excitement at the very first stop after entering AfrikaBurn! This is possibly one the greatest ways to have fun with your clothes on (optional!). Greeting is a super way to meet other volunteers. If you are part of a theme camp, we encourage you to take a shift or two with your whole team. Families often do it together too! For a first time volunteer who enjoys interacting with people, this shift is ideal! Paula & Gustavo - Gulden I saw yesterday at touch of madness, happy to volunteer in Greetings!! I would like to participate! Choose me! I like hugs and smiles. Let the fun begin - again! I like goats and penguins. Me and a buddy will see you there! Im excited to join, alongside other participation's too. Welcome, All things Greet and Small!